This Irish pub is a touch on the upscale side, at least as far as clientele is concerned, and a non-collegiate happy hour haunt. 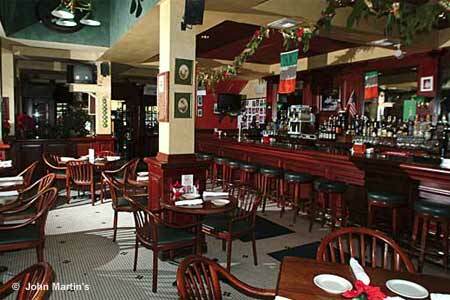 : This may be the only place in town to satisfy a craving for cozy Irish fare. Long prized for friendly, familiar service and a not overtly rambunctious party atmosphere, it seems to be the place for Irish soda bread and smoked salmon, shepherd's pie, a whiskey-infused Gaelic steak or the highly recommended bangers and mash. Among traditions to drink are ale, stout and, of course, the Emerald Isle's fine malt whiskeys that can stone anybody's blarney. And if it's intemperance you're after, try John Martin's immense and highly praised Sunday brunch which features an Irish country breakfast in addition to classics like pancakes, omelets and eggs Benedict.